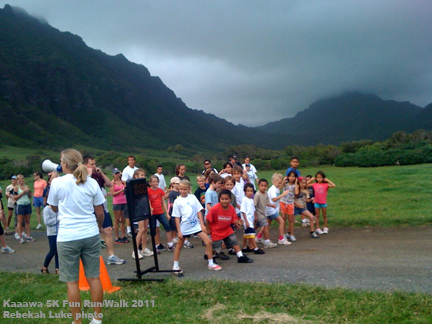 The 2nd Annual Ocean Warrior 5K Family Fun Run/Walk sponsored by Kaaawa Elementary School and hosted by Kualoa Ranch was held this morning in Kaaawa Valley. Some things take a long time. Waiting for an oil painting to dry is one of them. 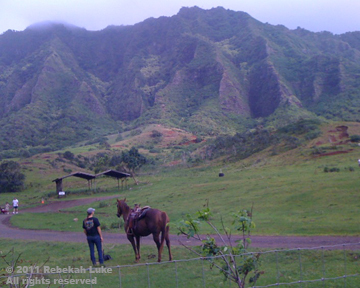 Here is “Kaaawa Valley Morning.” I painted it in May and varnished it this week. It’s already sold to a happy family waiting patiently to hang it in their home! Oil paint takes at least three months to dry. A painted canvas should be bone dry before adding a protective varnish coat, for best results. So when commissioning an original painting, allow at least six months for delivery. That would be the technical aspect. As for the practical aspect, each artist has his/her own process that varies from artist to artist. Perhaps plan on a little longer. Last Thursday I was happy to see Kit Kowalke, among other lovely friends, at our art reception at Ho‘omaluhia Botanical Garden. 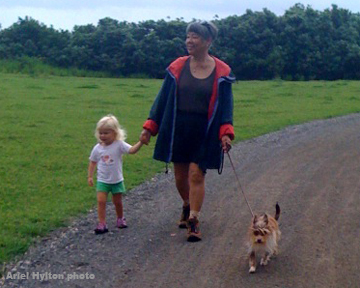 I first met Kit, an artist and art educator, when she was teaching at Honolulu Community College and I was in university relations. She was always cheerful, always a pleasure to be around, always sharing and helpful, always fun! And she still is. She asked what medium, I said oil, she asked how do I paint, I said one at a time. That is, I like to finish one painting before starting another. And that my paintings take a long time to dry. Oil painters often switch to acrylic because the medium dries quickly, and they can get their work out on the market faster. Personally, I’ve been partial to oil because of the way the colors mix and look. What I didn’t say was that I don’t like the state of unfinished-ness, or that unfinished projects are stressful to me. Well, that’s a perspective I’ll consider. And, I think that will ease my stress over things like unfinished home and garden remodeling projects. I can think of them as works in progress! She asked more questions and gave me more tips, even volunteered which classes and workshops I could attend nearby. Which is what my intention was when I first left art school—to regularly keep my eye in training by always taking part in a studio class. It is the advice given also by my tai chi sifu Alex Dong, who advocates not waiting until you have mastered a set before learning a new one because there are aspects of each set that help in understanding other sets. Or, (my interpretation) you will always be improving on the basics. Clicking on the above link to his website takes you to his journal article about the subject. Somewhat similarly, when I was taking beginning kumidaiko (Japanese ensemble drumming) lessons and had an interest in composing, I asked the master Kenny Endo at what level one could start composing. How long must I study taiko before I would have enough knowledge to write drum music? He replied he believed one could start composing at any level. Some things to think about. In my case, they still may take time because that’s my process. So far. Quite a few images are ready to leave the studio; these paintings are dry! See my PAINTINGS page. 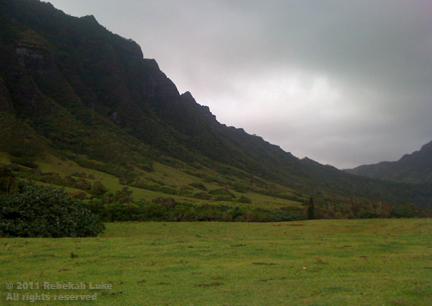 If you are on Oahu, visit the art show at Ho‘omaluhia Botanical Garden during August 2010. Please see my previous post about seven artists. 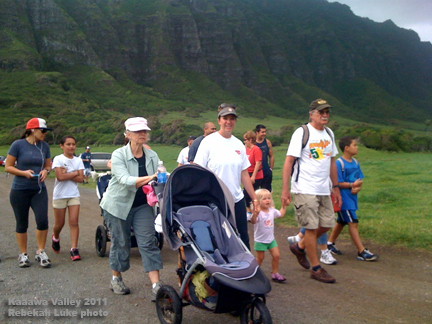 This morning was perfect for the “1st Annual Kaaawa Elementary School Ocean Warrior 5K Family Fun Run/Walk” in Kaaawa Valley, a short ways down the road from the studio. The film industry uses this location for movies and TV shows. This is the beautiful place where Miss Marvelous’s parents wed. Many thanks to the Kaaawa Elementary School PTO Committee and Kualoa Ranch for coordinating a successful community event. 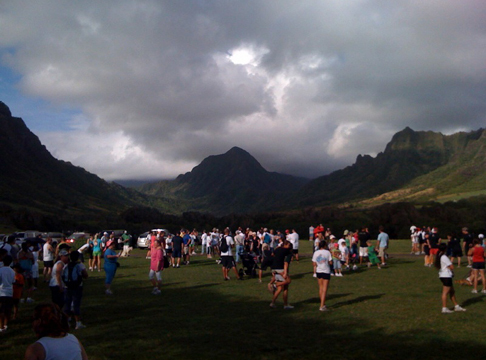 The entry fee bought access to the course trails, the event t-shirt, a bottle of water, and a coupon for 50% off of three different activities at Kualoa Ranch. Shave ice, spam musubi, cotton candy, music, and the great outdoors made for a great party! 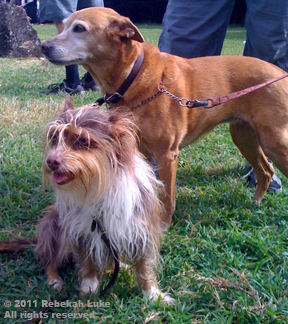 We could have brought Alice Brown and Pua (guest dog), as plenty of other people brought their canines, and the event folks offered free poop bags, but, alas, we had left the pooches home. I brought my easel and took the opportunity to sketch out a new painting of the vista. 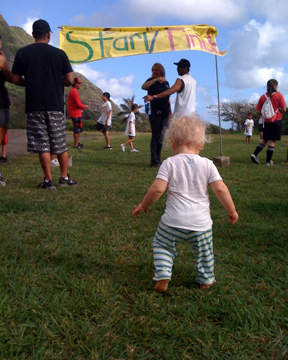 Miss Marvelous was among the youngest entrants to show off her new walking skills. Congratulations, Kaaawa! Everyone had a good time!